For the first time in years, the European Union (EU) and China advanced on Monday in Beijing on trade issues during the annual bilateral summit. This advance takes place with the scenario of the threat of commercial war that is approaching with the United States. After years of slow progress, at the summit of the Chinese capital negotiations on an investment agreement received a new boost. For the first time in three years the meeting concludes with a joint statement, which corroborates "strategic cooperation," said the president of the European Commission, Jean-Claude Juncker. Both parties agreed to give new impetus to the negotiations, which for the last four years have only been moving slowly, on an agreement to protect investments. It was also agreed to create a working group to reform the World Trade Organization (WTO). "The EU and China are two forces of stability," Chinese Premier Li Keqiang said after talks with Juncker and European Council President Donald Tusk in the Great Hall of the People. Due to the large trade deficit of the United States, Trump has imposed a series of tariffs on products from the European Union, China, Japan, Canada or Mexico, among others. After a first round of tariffs on imports from China worth 34,000 million dollars, another round worth 16,000 million this month will be imposed. Before the end of August, Trump threatens to impose more tariffs on Chinese products. The EU is China's largest trading partner, while for Europeans only the United States exceeds China. Daily China and the EU exchange products worth 1,500 million euros. In a joint eight-page statement, both sides argued at the summit for a free global trade system with the WTO as the core. On Trump's threats to impose punitive tariffs worth up to 500 billion dollars on Chinese products, Li said: "China does not want a trade war with the United States. No one wins in a commercial war. " Tusk called on Trump and Putin to collaborate with Europeans and Chinese and to pay attention not to destroy the world order. A day after Trump called Europeans "enemies", Tusk said in reference to the summit in Helsinki and the meeting between the EU and China in Beijing: "We are all aware of the fact that world architecture is transformed before our eyes ". The old world order put an end to the Cold War and brought peace to Europe and China to development, he added. "It is our joint responsibility not to destroy that order in Europe, China, the United States and Russia, but to improve it," Tusk warned. "Not to start commercial wars that so often in our history turned into warlike conflicts, but to reform the established world order in a brave and responsible way," he said. Tusk called on Trump, Putin and China to reform the WTO together. The reform of the WTO should revolve around subsidies to industry, the protection of intellectual property, the transfer of technology, the reduction of commercial costs and a more effective conciliation in the dispute. Both parties also exchanged their offers for a further expansion of the market in order to take forward the investment agreement that for Europeans is a requirement for a free trade agreement. Negotiations enter "in a new phase" and receive a "strong boost," Li said. 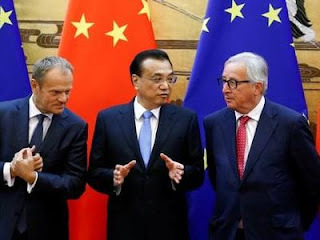 Rolando Dromundo, Ph.D. in Geopolitics at the University of Pisa in Italy believes that China and the EU will have partial success in their objectives, stating that he does not believe that either side wants to reach a maximum confrontation with the US. "The logic of how the global economy works ultimately leads to many interests around maintaining the dominant economic policy, so there can be important agreements between China and the EU in maintaining the status quo of the free trade discourse and the neoliberal and hegemonic policies in the last decades ", explains the analyst. For its part, the president of the European Council, Donald Tusk, warned that trade wars can lead to real wars, by stating that Europe, China, the US and Russia have a common duty not to destroy the global order, but to improve it through a reform of international trade rules. Dromundo disagrees with this manifestation of Tusk to indicate that "in many epochs of history it has been like this, but in this case it is different because it is about nuclear powers, and the immediate ghost of a military conflict is neutralized (...) because it would lead to the destruction of the planet."